My highlight every Tuesday is teaching Karate to the Seiritsu Kindergarten students with Kakiya Sensei's excellent support. 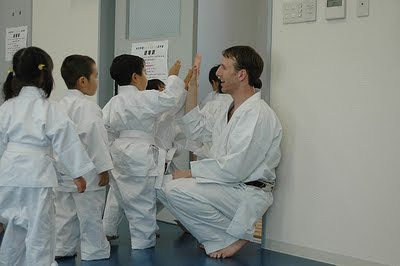 We've been teaching Karate for the kindergarten for 4-1/2 years now! The practice lessons are 30 minutes long, first for 3-4yr olds, then 4-5yr old, and last for 5-6yr olds. 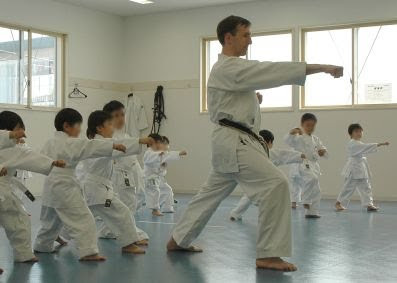 Last weekend, I heard about another private Karate club that has a kindergarten Karate program that is so strict the students often cry by the end. I was saddened to hear this because those kids will grow up with a negative view of Karate. It's important Karate practices teach discipline and a proper techniques, but lessons should also be fun too. I want to plant the seed of enjoyment of Karate for their whole life. Our Karate lessons focus on enjoyment, basic form, and simple Budo ideas, like making sure everyone gets a turn. Kakiya Sensei is great at imparting these messages. Plus I try to mix Shiramizu's Arakawa Sensei's very positive approach to kid's classes with my own ideas to offer an unique experience. Probably the kids will enter a new dojo when they become elementary students and be surprised the counting is done in Japanese, not English!